6 years ago (can you believe it?!) 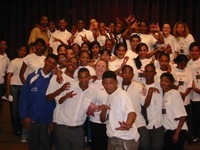 we started a theatre training programme at Dominican School for Deaf Children in Wynberg. We knew nothing about the Deaf or Sign Language or Deaf Education but we just figured, “Hey, Deaf kids should be able to do theatre too…” and approached the school to set up weekly classes. We were beautifully naive as to what we were getting ourselves into, and totally clueless as to where it would take us, but such was the beginning of our work in the Deaf community. Today, 6 years later, the programme has gone from extra-mural, non- compulsory classes with any of the learners who happened to be around on a Monday afternoon to being compulsory, assessed classes with all the senior learners in the school. It has gone from being managed by Tanya Surtees to being being managed by Deaf company member, Lysander Barends, and sees us taking learners through a series of modules selected from: Creative Movement, Traditional Dance, Physical Performance, Mask Work, Mime, Physical Animation, Theatre Appreciation, Theatre Making, Theatre Design, Identifying Jobs in Arts and Culture, and Capoeira. Yip! We couldn’t sign for the love of cheese when we started the programme at Dominican! It is a tribute to the willingness of the learners to meet us more than halfway (and the fact that we kept going back until they realised that we weren’t going away and they had to engage with us!) that we managed to communicate at all with each other. But besides the development in our signing, one of the most exciting developments in the programme (although there have been so many!) is the establishment of the annual Arts & Culture Day that we hold at the school. It first started as a performance by the learners for their peers, just to showcase what they had been working on throughout the year. QUACK! Back bigger and better than ever before!